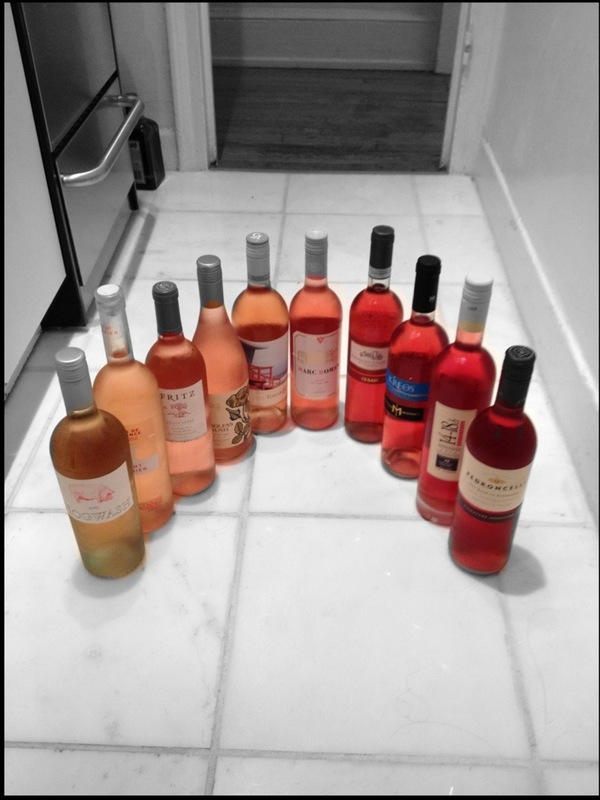 Rosé Week is coming!!! Get ready. Also, I just saw The doc SOMM and it made me laugh when he had to chill the wine. I still haven’t found the perfect way to do that quickly! I’m ready for Rose’week, love it! This may not be the PERFECT way to chill wine quickly, but wrap it in a wet paper towel and put it in the freezer for 20-30 minutes. I’ve tried that! My going procedure is fill the sink with both ice and water. Some people say add salt to that, but i haven’t seen it do much…. How long does that take to get it chilled to a good drinking temperature? I don’t have an ice-maker so usually not lots of extra ice. In my experience, at least 30 minutes but usually closer to an hour for full effect! I’m thinking that’s about the same as in the freezer. Last night we “froze” a bottle about 30 minutes. It was chilled enough that we each took a small taste and stuck it back in for another 20 minutes. Have you tried those “wine sleeves?” They’ve never worked for me. I just saw “Somm” today too! Great documentary about the profession! I have had good luck with the sleeves, I put them on and then stick the bottle w/ sleeve in the freezer for 10-15 minutes. But you couldn’t do this at a restaurant probably. Must run out now and get some rosé. Add A LOT of salt. Like, 1/2 a cup for one bucket. It will chill that baby in 20 min flat! Ahhhh, I usually just do a healthy sprinkling, but will try that. The whole method bugs me because then you have this drippy, salty bottle! Ah well, all for the good of the glass! I see a few I’ve tried – can’t wait to read your thoughts on all of them. You will love the 14-18 from Greece (one of their new world wines). Cheers!!! That one was super interesting – I liked! yes, it’s crazy – I took a similar test at the American Sommelier Association and never got why they make you do it under tight time constraints. Happy sampling! Sipping a lovely rose right now! An interesting blog to follow. Specially for winelovers!